Once you’ve bought your tent, your next major consideration will be what equipment to buy to ensure you get the best night’s sleep possible. Here’s a guide to help you choose. Whilst some people can adapt to the challenges of sleeping on the floor, sleeping in a regular sleeping bag with only the groundsheet between yourself and the floor does not often lead to a comfortable night’s sleep. For some added comfort, you have two main options – a camping mattress or a Sleeping Bed. Both offer their own advantages and are discussed in more detail below. But whilst both provide added comfort, neither will raise your body particularly far off the ground. Therefore if you don’t like the sensation of sleeping close to the ground, however comfortable, there is also the option of buying a camp bed. Whilst it will not be suitable for some smaller, lower tents, inside a larger family tent it offers you a solution to this problem. There are several factors to consider in terms of deciding which sleeping mat or camping mattress to choose. The first is perhaps the simplest – do you need a single or a double mattress? A key factor in deciding this is to look at the floor space inside your tent, as this will determine how large a mattress you can actually fit inside. The second factor is whether to go for an inflatable mattress or a foam mattress that remains at a constant thickness. Inflatable mattresses can offer greater levels of comfort, but must be inflated and deflated before and after use. A third option is a self-inflatable mattress such as the Quechua A300 Mattress, which offer a compromise between the convenience of a foam mattress and the comfort of an inflatable mattress. Another important consideration is the ‘folded size’ of the mattress. Whilst a mattress might fit inside your tent, but if it is too large for you to actually transport it then it will not be a worthwhile purchase. Studying the folded size (and weight) of the mattress is essential for any backpackers, but even if you will have access to a car during your camping holiday, it is still worth considering as a mattress with a smaller folded size will be easier to store at home following your holiday. The Sleeping Bed offers an alternative to the traditional pattern of buying a separate sleeping bag and mattress, and come in two main varieties. The first is a sleeping bag with an integrated self-inflatable mattress built-in, such as the 15° Sleeping Bed. This built-in mattress can be detached, meaning that both the mattress or the sleeping bag can be used on their own as well as together, offering a 3-in-1 sleeping solution. The other variety is mattresses with integrated duvets such as the Single Sleeping Bed Camp, providing a more portable option for people who prefer duvets to sleeping bags. Sleeping bags come in a range of varieties, but there are a number of features to consider when deciding which is the best for you. 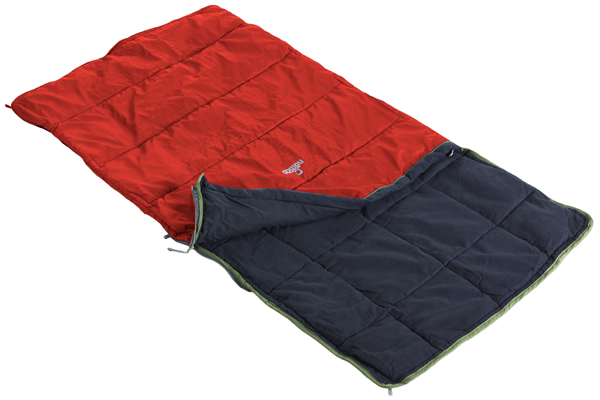 One of the most essential features is the temperature that your sleeping bag is designed to cope with. For example, the O° Quechua Light Hiking Sleeping Bag is designed to be comfortable at O°. Therefore if you are camping in that sort of temperature, it will be an ideal sleeping bag to ensure your temperature is comfortable throughout the night. Yet if you are camping in warm temperatures, other sleeping bags will be more suitable, such as the 20° Basic Camping Sleeping Bag, which is designed for use when the temperature is 20° and above. Therefore identifying the likely temperatures during your camping trip will help you to choose a sleeping bag that will provide the most comfortable night’s sleep. If you will be camping in a wide range of temperatures and don’t want to buy multiple sleeping bags, choose a bag that is suitable for the lowest temperature you expect to encounter as it is easier to find ways to lower the temperature in the tent at night than increase it. Size is again another important consideration. The sleeping bag should be large enough for you to sleep inside of comfortably, so check both the size and the dimensions prior to buying to ensure that this will be the case. As with the camping mattress, the folded size is also important, particularly for backpackers. The smaller the folded size of your sleeping bag, the more space you’ll have available for additional equipment and supplies. And finally, if you are going to be using the sleeping bag regularly, it is worth investigating whether it is machine washable or suitable for a tumble drier. Sleeping bags are not the only option. Your normal duvets or blankets will work too, and depending on the type of mattress you choose a bed sheet is an option too. The advantages of this set up is that it brings the comforts of home with you when you are camping. However, the major problem is that they are not designed specifically for the purpose of camping. Duvets in particular are notoriously difficult to transport, taking up a lot of space and being difficult to reduce down into a smaller size. This clearly rules them out for anyone backpacking, and even if you have access to a car, anything more than one duvet will be too large for most hatchbacks. However, if do have a car available offering the necessary space, it’s an option that will give you added comfort. If you have perhaps already got a sleeping bag that maybe isn’t completely suitable for what you need to ensure a comfortable night’s sleep, other sleeping equipment can help you get the comfort you need. Liners and pillows can help provide additional comfort, whilst if your sleeping bag is not designed for the cold temperatures you are encountering, then a Fleece Blanket is an option for providing additional warmth. More camping equipment, you can click Basic Tent Camping Equipment | Sports Related. 10 best national park campsites across the USA | Sporting Life. Selecting the Right Hiking Equipment Before Going on a Outdoor camping Trip | Sports and Exercise. Basic Tent Camping Equipment | Sports Related.